Skipper Scott Cuthbert believes that Town’s 3-0 defeat to Coventry City at the weekend is only a blip in their battle for automatic promotion this season. Trailing 1-0 going into injury time, the Hatters conceded twice more after Glen Rea was sent off, making the scoreline look a lot worse than it actually was. We’ve set the bar so high, we’ve been absolutely fantastic home and away, got ourselves top of the league, and it’s just a little blip. Although the result also saw Town knocked off top spot, dropping to third place, Cuthbert said: “It was a lot closer game than that. “We’re disappointed that we gave them the advantage early on with their only chance, as we’re usually really good at keeping it 0-0 and not having to chase the game. “But unfortunately we did that and their defensive record speaks for itself. “They’ve only conceded eight this year in 16 games, so they’re defensively strong. “We knew what we’d be up against, but we’ve created a lot of chances and that’s the disappointing thing. “On another day we would have taken them and we’d be sitting here one each. “It’s easy to be down just now, the boys are all down, we’ve been on a fantastic run, unbeaten in nine since the last 3-0 defeat. “But we’ve set the bar so high, we’ve been absolutely fantastic home and away, got ourselves top of the league, and it’s just a little blip. “We just need to get our heads down. We’ve got a nice little break, got the FA Cup on Saturday, so it’s a nice distraction from the league just to gather ourselves and then it’s Cheltenham away next. Although Cuthbert was looking for the positives after their first defeat since September 9, he couldn’t hide his frustrating at losing their lengthy unbeaten record. He continued: “We’re massively disappointed, we’ve been fantastic at home this season, and things just never quite fell our way. “We gave them an advantage with probably the only chance they’ve had in the first half, they’ve taken it, had something to hold on to, they’ve been defensively strong and we just struggled to break them down. “I know they went on to score two and three, got a second and third goal, but we’re pushing for the game, we’re a man down, so you can’t look at that too much. “We’re disappointed that we couldn’t at least get a goal and get the game level at a real important stage as we felt they were getting deeper and deeper. “We were getting a couple more chances, we were having a lot of the ball, their keeper’s made a couple of good saves, there’s been one off the line in the first half as well so we’re disappointed. “We’ve set the bar really high this year. We’ve had some fantastic performances, individual performances and team performances and I think we were just a bit below that to be honest. 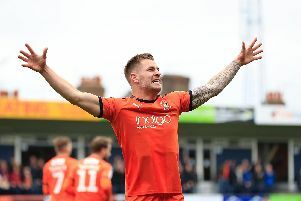 Although Cuthbert was thrown upfront late on, it didn’t have the desired effect this time, with Luton shipping two goals in his absence from the back-line. However, he has how urged his side to go again as they did after their last defeat, adding: “That happens when you’re pushing for the game, you kind of throw caution to the wind and push players on and just try and nick a last minute goal like we did at Wycombe.